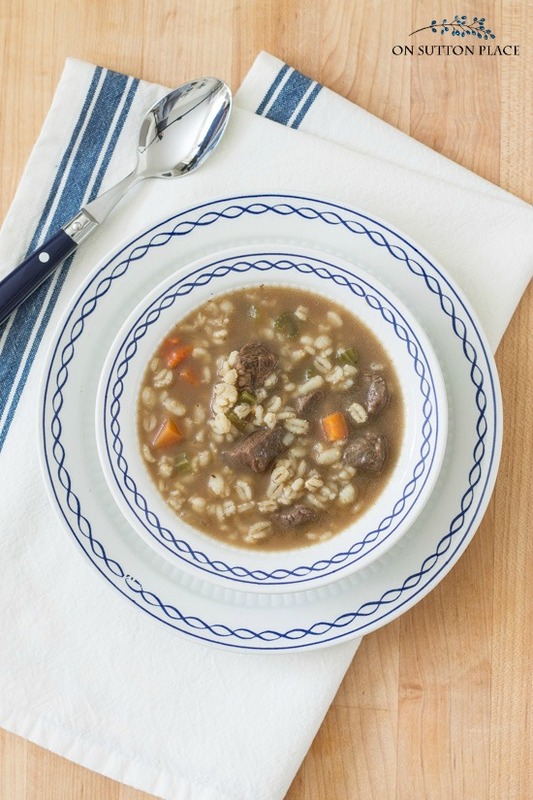 Hearty and super simple, this beef barley soup recipe goes from stovetop to table in about an hour! Perfect for busy weeknight dinners or Sunday Supper. Semi-homemade and delicious! Years ago, my husband came home one day and told me about this amazing beef barley soup he had at our local Elks. Keep in mind, this is a guy who, when you ask him what he thinks of ANYTHING, his answer is “It’s fine.” He just doesn’t get excited about too many things. Anyway, I started asking questions about the soup. What was in it? Was it thick? Was it all barley or just a little barley? He was no help at all so I decided to just make up my own recipe and see what he thought. Instead of “It’s fine,” I got “That was pretty good.” So I’ve been making this simple and hearty beef barley soup ever since. 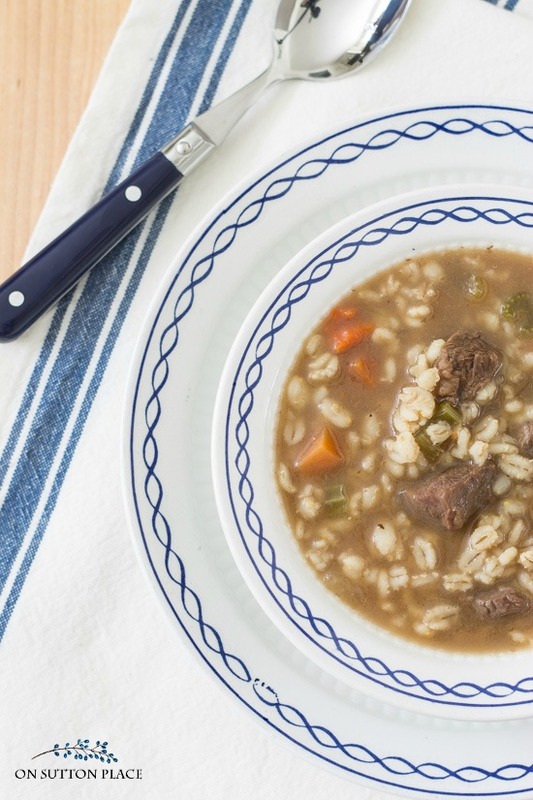 Hearty and super simple, this beef barley soup goes from stovetop to table in about an hour! Perfect for busy weeknight dinners or Sunday Supper. Semi-homemade and delicious! In the bottom of a soup pot, swirl olive oil to almost cover the bottom. Add stew meat, carrots, celery and onion. Cook and stir until beef is well browned. Add cartons of beef broth. Lower heat and simmer for 1 hour stirring occasionally so barley doesn't sink to the bottom. I find barley in the rice section of my grocery store. This beef barley soup is something I can make at the last minute (it takes about an hour from start to finish) and it looks like I’ve been cooking all day. It really is so easy but tastes like it’s made completely from scratch. One variation that is very good is to substitute tomato juice for one carton of the beef broth. I really like it that way but my husband prefers the basic version…so that’s what I usually make. I made this soup for the second time today. It was delicious both times! This is a recipe I will use over and over again! Thank you Ann! You are welcome! I just made it this week too…my dad and my husband love it. Thank you so much and happy holidays! Ann, I printed your recipe so that I can make this soon when we start adding a few carbs back into our diet. Barley is one of those “good” carbs that we can eat! 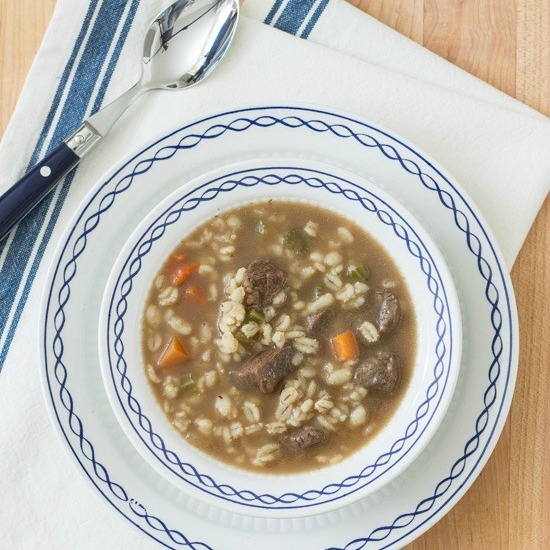 Love Beef Barley Soup….pinning away…gorgeous pic Ann!…Have a great weekend! I had to laugh because whenever I ask my husband what he thinks of this or that, he always says, “It’s fine”. I am certainly going to try this soup! Think I’ll try it with ground beef. I like barly in vegetable soup too! Thanks for the wonderful recipes you put on your site! That made me hungry! I’m going to give this a try. I have never tried barley soup before. Thanks. This soup looks wonderful…..very hearty and definitely perfect for this time of year. Wish I had the ingredients in the house two days ago when I couldn’t get out because of the snow storm and icy roads. Snow in North Carolina…..not a very common sight, but it happens every so often. My grandsons were out of school for 3 days. Wow, were they thrilled. I’ll have to try this soup recipe. Thanks. Oh, Ann I can’t wait to make this! Thanks for the recipe! I bet my husband would love this too :) I’ll try it soon! I make this soup using hamburger instead of the stew meat and my husband loves it. I also made it last week using chicken, after I had some at a local restaurant and loved it. Oh I bet the hamburger is delicious. Thank you for sharing that! Sounds good and warm. Hopefully my husband will like it! This so reminded me of my Grandfather. He also was a member of the Elks’s and loved this soup! Yum! I am making this soup this weekend. My friend brought some to school to share years ago and I loved it. Made a delicious ham and bean soup Tuesday. Homemade soups are the best. Thank you for the recipe. This brings back memories, it is my Dad’s favorite soup and I have never attempted to make it. I love barley so I guess I should give it a go.